Boxworth is a very small village situated to the north-west of Cambridge. In the Middle Ages, it had a significant population, but in the modern day there are only around 100 houses in the area including one belonging to my customer. 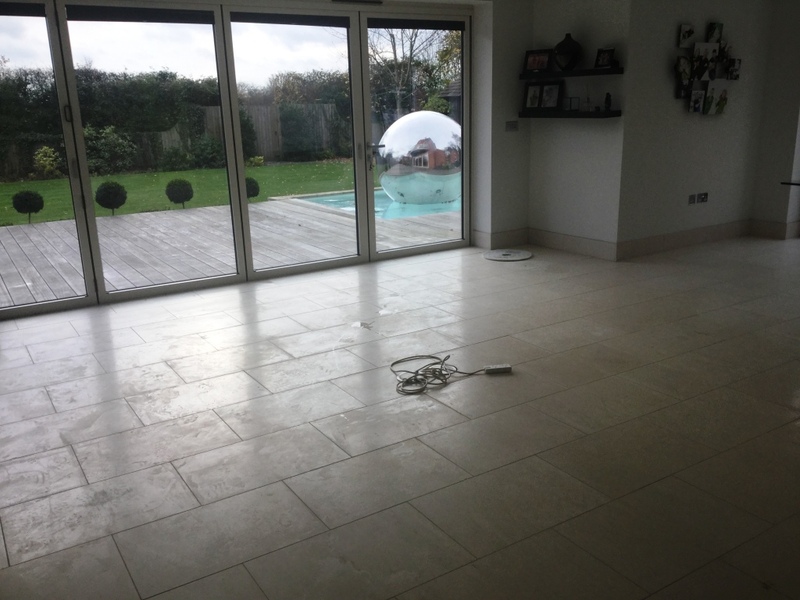 I was there to take a look at a large installation of Polished Limestone floor tiles which had been laid throughout the ground floor including the Kitchen, Dining, Utility room and hallway. 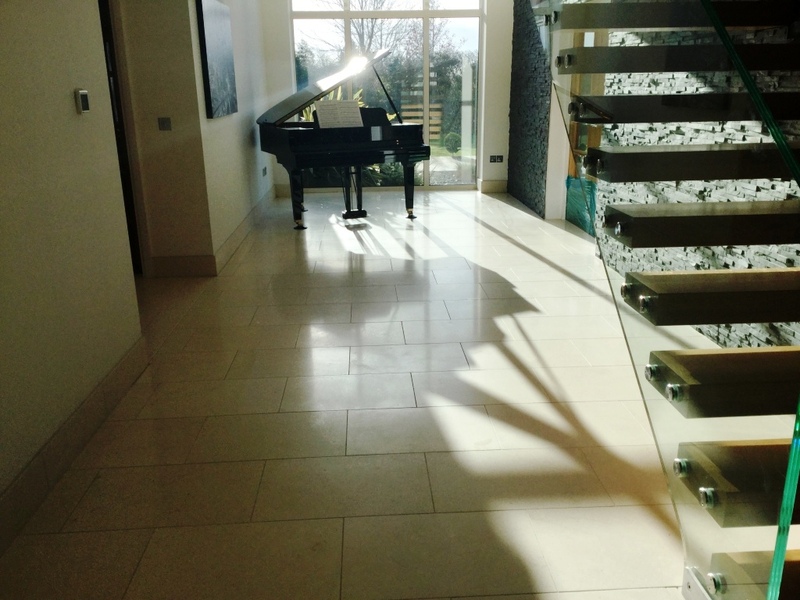 Many people will already know that Limestone is a premium, yet somewhat sensitive natural stone. 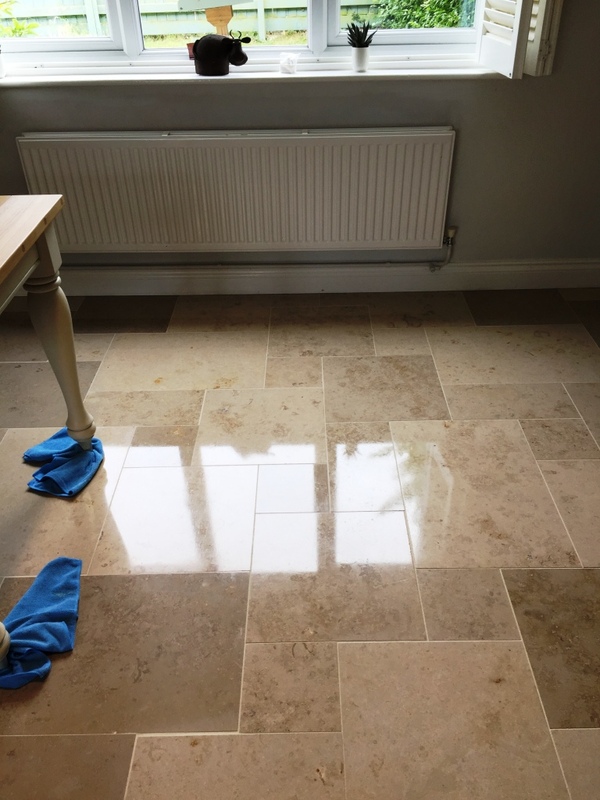 It’s also porous, meaning that dirt can easily become ingrained if the tiles are not sealed properly, or if the sealant has worn away. 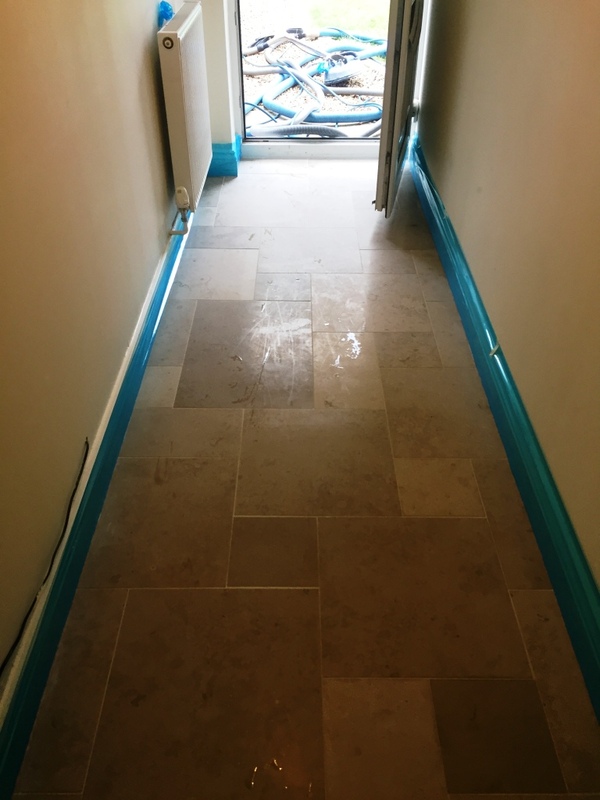 This leads eventually to a very unappealing, dirty, and dull appearance which often happens so slowly it hardly get’s noticed until one day you think, “I’m sure my floor looked better than that before!”. 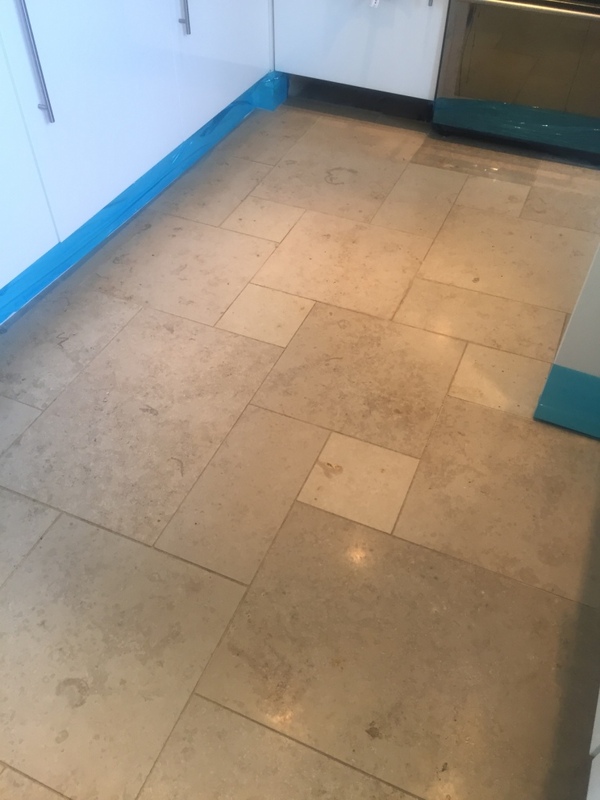 In this case the sealer had degraded over time and my customer had called me in because she was now no longer happy with the appearance of the tiles. The lustre the tiles once had eventually disappeared and there was also damage in some areas caused by the placement of table and chair legs. I was asked to restore a high-quality polished finish to the tiles. Before beginning the restoration, I took the necessary precaution of covering the walls and kitchen units to protect them from exposure to any cleaning products or mess. 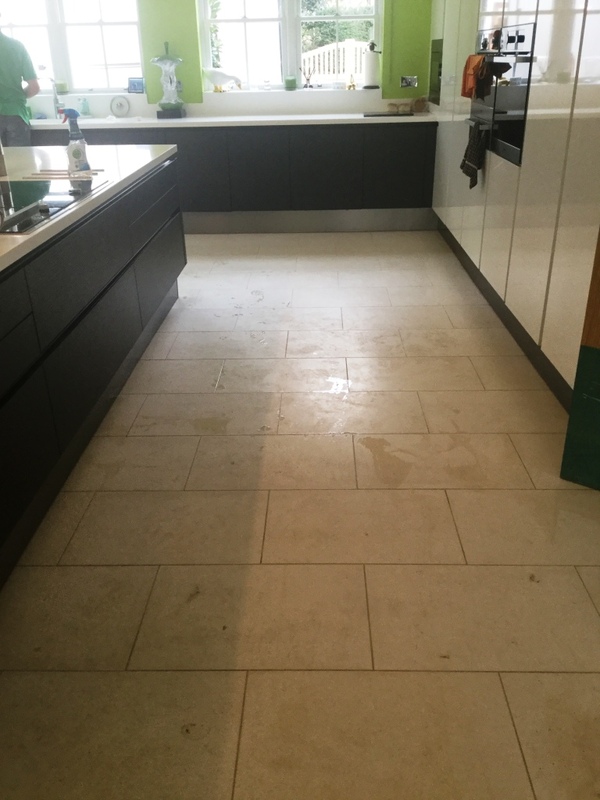 To begin, I applied Tile Doctor Remove and Go, which is a high-performance stripping agent, to break down any old sealant remaining of the tiles. 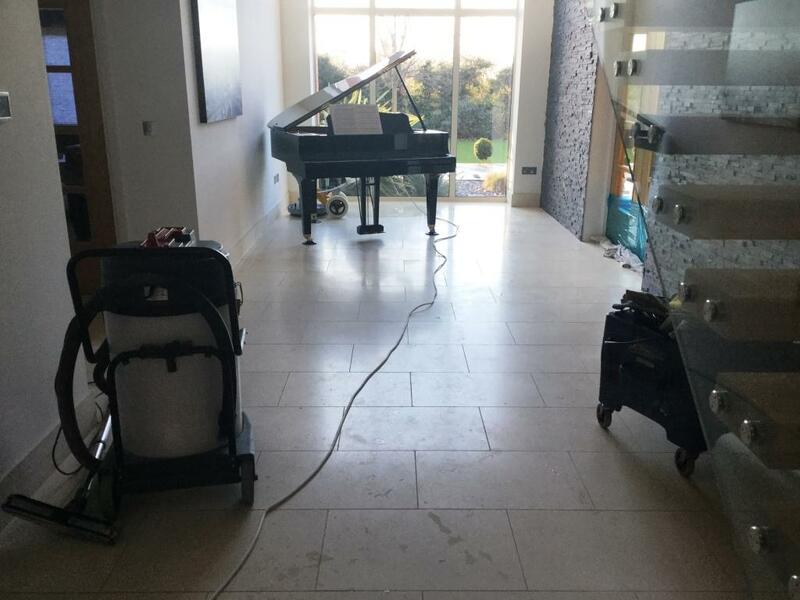 This product can also be used to clean the stone itself, as well as the grout lines. After completing the initial cleaning process, I moved on to restoring the polish to the tiles. 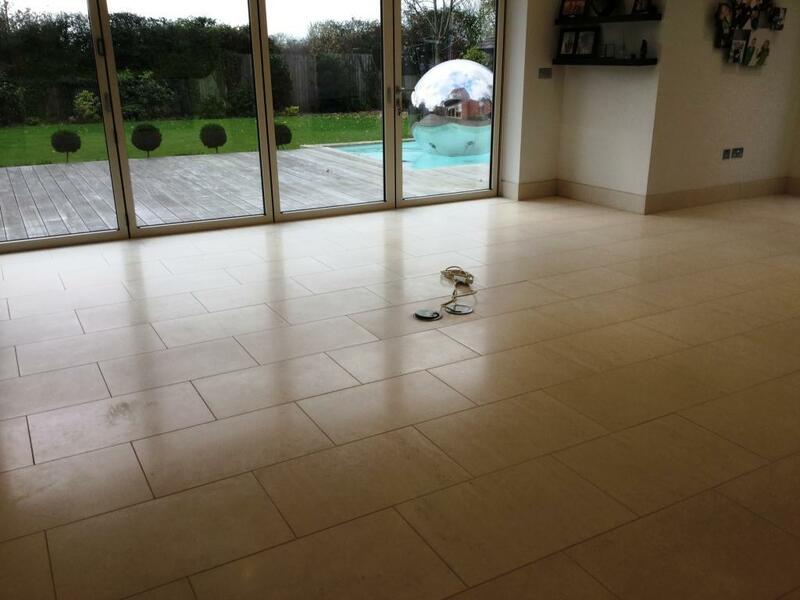 At Tile Doctor, we do this using a system we have developed called Burnishing. 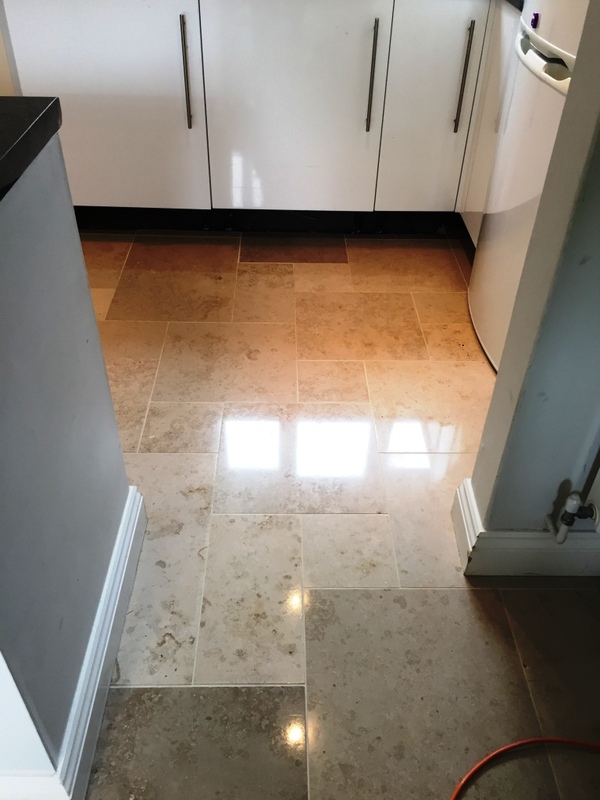 This system involves the application of Diamond encrusted pads – each possessing a different level of grit – to grind away the dirt from the stone, which is often stained or damaged. The process effectively resurfaces the stone leaving it looking new and fresh. Firstly, I applied the Coarse 400 grit pad, fitted to a rotary machine, to grind away any excess muck and sealant lubricated with a little water. The resultant slurry was rinsed away and I followed up with the application of the Medium 800 grit pad to start the restoration of the polish again with a small amount of water, followed by the Fine 1500 grit pad for the second polish. Finally, I applied the Very Fine 3000 grit pad to achieve the most refined and highest quality polish possible. The process of burnishing is a gradual but highly effective means of achieving this kind of finish. Any slurry that was created through this process was removed using my truck-mounted hot water cleaning and extraction machine, resulting in minimum mess. 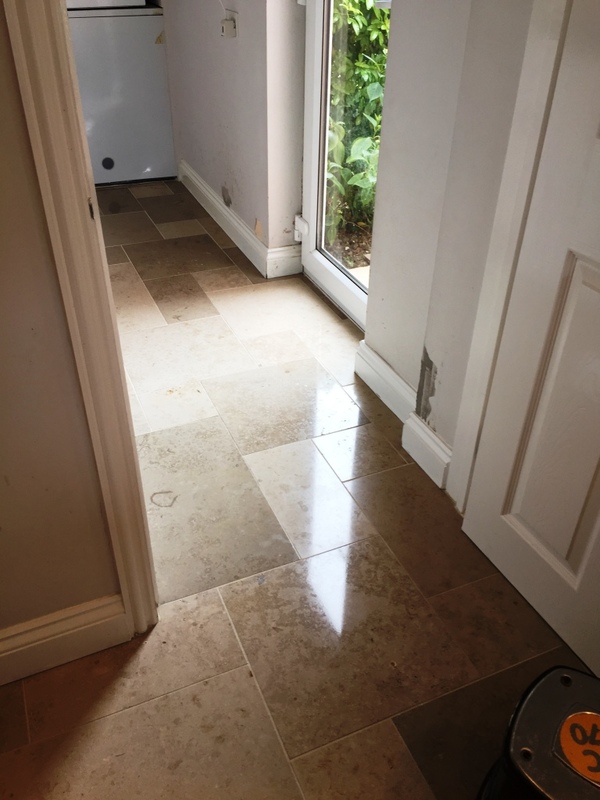 After burnishing the tiles and to achieve a really hard wearing and high polish I covered the floor in Tile Doctor Shine Powder crystals and buffed them into the Limestone tiles using a White buffing pad. 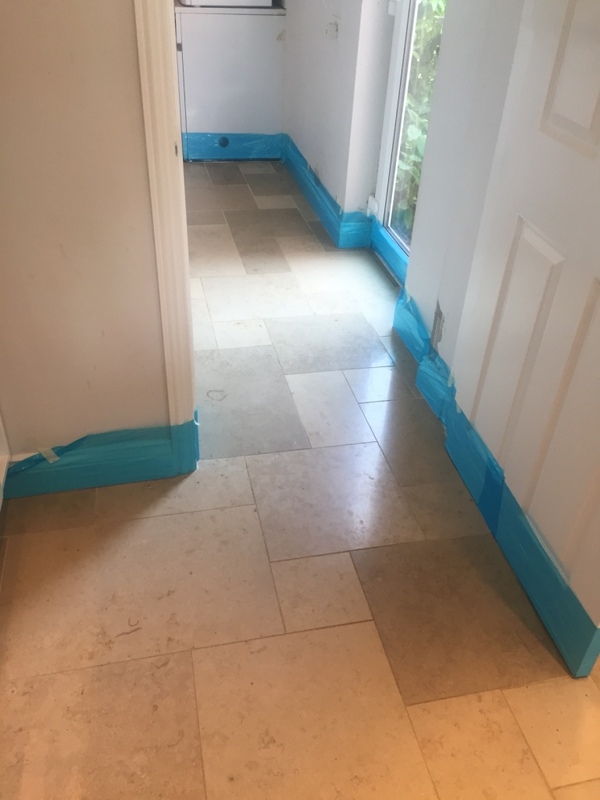 Then to give the floor extra protection I applied a coat of Tile Doctor Colour Grow, which impregnates the pores of the stone to prevent ingrained dirt. 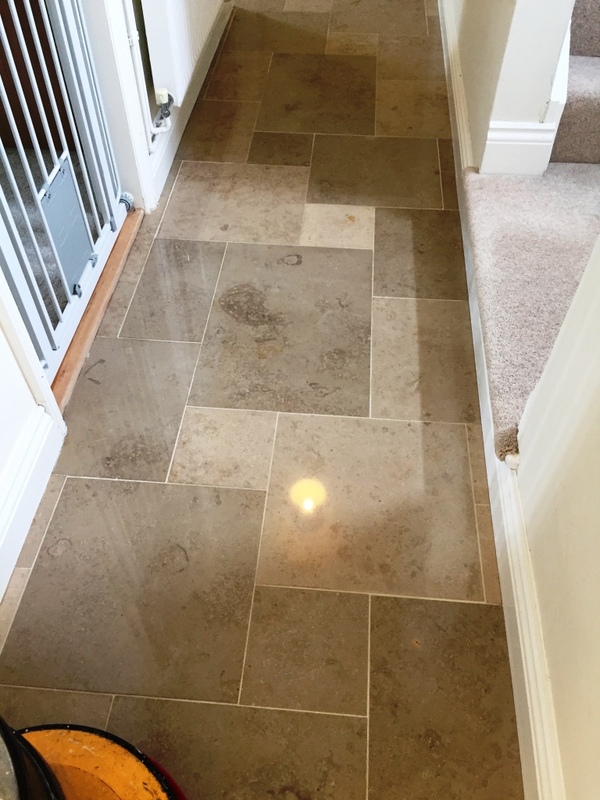 Colour Grow also intensifies the natural colours in the Limestone, thus improving the appearance of the stone to an even greater extent. 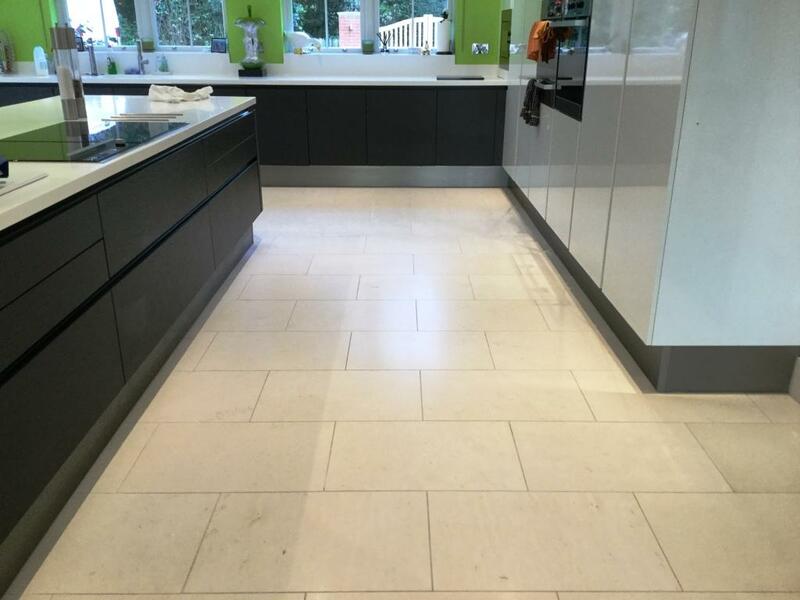 Following the application of Colour Grow, I gave the tiles a final light buffing with a soft red pad. 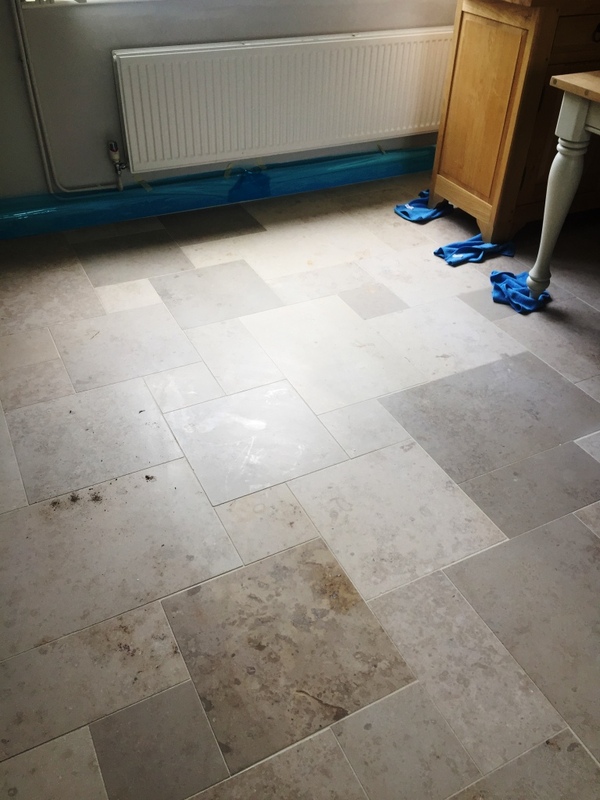 The customer was extremely happy with the outcome, remarking that the work was carried “quickly and efficiently with no fuss.” I took lots of photographs of the process, so you can really appreciate the difference that was made.